Our names are Erik and Ani (and our adorable dog Lilo). We are a happy, fun-loving couple from Kirkland, WA. We are very excited to start growing our family through adoption. As you read this letter, we hope to show you a glimpse into our lives and the loving environment we are ready to share with a child. We respect and admire your brave decision to consider adoption and wish you peace throughout the process. Thank you so much for taking the time to get to know us! After our first date at a Thai restaurant back in 2005, there was no looking back. We instantly hit it off and spending time together felt natural. We share similar interests and values and both like to laugh a lot. Our wedding in 2008 was a large celebration that brought together two families and two beautiful cultures. Shortly after getting married, we relocated for Erik’s work to Austin, TX. These first two years of marriage were filled with weekend getaways, Texas BBQs, golf and exploring a new city. After two years, we decided to move back to the Seattle area to be closer to family. We are both very active people and enjoy golf, tennis, fishing, hiking, travel and spending time with family and friends. We play in a Monday night golf league during the summer and participate in the neighborhood pickleball tournaments. We love to host friends and family at our home and serve up a good meal, usually seafood which is Ani’s favorite thing to cook. Erik, who grew up working at his father’s bakery, makes the dessert and selects the wine. We keep life simple and take time each day to eat dinner together and walk the dog, taking different routes to get landscaping ideas from other homes in the neighborhood. 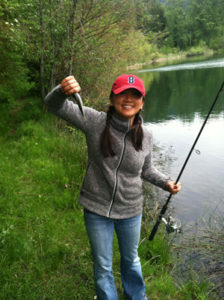 Ani is originally from Laos and she and her family immigrated to the US when she was young. We have been fortunate to travel back to Laos three times. Erik’s family is from Iowa and both of his parents grew up on farms that are still in the family. 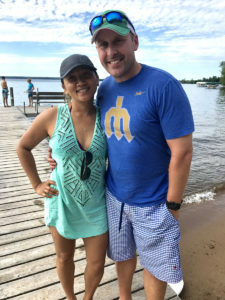 We travel back to the Midwest every year for the 4th of July and 30+ family members rent cabins on the lake in northern Minnesota. The week in Minnesota includes playing games on the beach, fishing, golf and playing nightly card games. Our relationship is built on trust, respect and open communication. We both support each other’s goals and aspirations and try to bring out the best in each other. When Erik was deciding whether or not to pursue his CPA license, Ani pushed him to study late nights and just “get it done”. We both count our steps each day and check in on each other – if we are short on steps, the dog gets a 2nd walk, rain or shine. Our friends comment that we are very natural with each other and love spending time together. We are both career-oriented but not to the point of excess – we realize that while work is important, it is more important to lead a healthy, balanced life that includes spending time with family and friends, relaxing and pursuing passions outside of work. We have dreamed of having a family for several years and talk about how fun it would be to take our child on long walks with us, to sporting events and to the wonderful park across the street. We have been blessed with two nephews and two nieces, who we absolutely adore and spend as much time as possible with. We host Thanksgiving and Ani has the little ones help her out with the cooking. One of our nephews is a big football fan and each time he visits the first words out of his mouth are, “Uncle E, can we go play football?” We are both avid football fans and enjoying going to the Washington Husky home games on Saturday and watching the Seahawks on Sunday. Our child will get exposure to sports, art and travel at an early age. Our child will have 4 cousins in the area ranging in age from 4-11 and will receive a lot of attention. Erik’s mother is retiring in 2017 and excited to be the grandmother of a new baby. We live in Kirkland, WA, a suburb of Seattle, which is a laid back, yet vibrant small town. We like that it’s walkable, has excellent schools and offers a clean, safe environment with a wide variety of activities including restaurants, coffee shops, water sports, tennis and much more. We bought a home within walking distance of the downtown area and located across the street from a large park. On Saturday mornings, we start the weekend off by walking our dog downtown and get coffee and breakfast at our favorite local bakery. Our home is blocks from the elementary school and most kids walk to school. When I first met Ani, I was instantly attracted to her smile, her variety of interests and her positive outlook on life. On our first date, she taught me how to say thank you in Thai, “Kop khun cup”. I was so smitten and eager to impress her I went home and studied the Thai dictionary and on our second date, had a couple phrases myself. After a very short time and many fun dates later, including a memorable date to the batting cage, I knew I had met someone special and had found my ideal partner in life. Ani has a zest for life, puts others first and has a very strong bond with her family. When Ani was 23 years old, she purchased a home for her parents in Eastern Washington, which provided them stability and included a large backyard so her father could fulfill his dream of having his own garden. Ani has an incredibly warm personality and to know her is to love her. She is happiest when we are at the beach with our dog or enjoying good seafood. She is a curious person and her sense of exploration has brought me out of my shell. I feel lucky to have met someone who has exposed me to so many new things. Our nieces and nephews absolutely adore Ani and there is no doubt she will be an excellent mother. Ani is very natural with the kids, teaching them to do art, cook or read books. She has often been referred to as their favorite aunt. Our relationship is built on trust and mutual respect and I am very proud to call Ani my wife. Each year, Ani plans a birthday get together for me, where friends and family are invited over to our house for an afternoon of enjoying good wine, barbeque and playing badminton in the backyard. One year she surprised me after golf, we went out to get what I thought was a “casual” dinner, only to find 25 of my best friends there to help me celebrate. In addition to having a big heart, Ani is very talented. She played college basketball at Central Washington University, can paint just about anything, is an excellent cook, and speaks 4 languages fluently: English, Thai, Lao & Spanish. Ani has traveled to more countries than I can name and studied abroad for two semesters in college. To say she is a good travel companion would be an understatement! Ani is also a driven person and has done very well in her career working for top companies such as Amazon, Microsoft, and is currently at Nintendo. Talents aside, Ani’s best trait is her giant heart and the way she treats people. She consistently puts others needs ahead of her own and expresses her love through acts of kindness and I will be forever grateful that she came into my life. Erik is a thoughtful, witty and kind-hearted person. The first time Erik brought me flowers it was a potted rose bush, which he said was so that I could enjoy them year after year. He also proposed with two engagement rings just in case I didn’t like the one he had picked out (which I absolutely love and still do today as I wear it proudly). Erik has many friends, which is a reflection of his character and the way he treats other people. His three best friends live close by and are people he has known since Jr. High School. Erik is very open-minded and has truly embraced the Laotian culture. I feel so lucky to have found him as my partner and can’t imagine going through this journey with anyone else. Erik is a sports enthusiast with passion for golf and college football. You will find Erik at almost every University of Washington Husky football home game rain, snow or shine. During the spring and summer months, Erik is often out on the golf course with friends and family – he is passionate about his hobbies, which I admire. Erik, also known as “Uncle E”, always makes time to play football and watch little league games with our nephews Brennan and Max. There’s never a dull moment with Erik and he is very active - he is sure to expose our child to an active healthy lifestyle. When it comes to work, Erik is hardworking and humble about his career achievements. 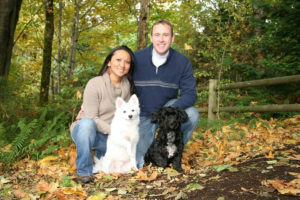 He is a CPA with a successful career as a finance executive at a small technology company in downtown Seattle. Unlike your typical accountant, he has quite an outgoing personality with a great sense of humor. Even though Erik works hard, he still makes it a priority to come home and eat dinner together every night as a family. Family and tradition are important to Erik. His mother, sister and brother live within a 10 mile radius from us which means we enjoy many family dinners and get-togethers often. 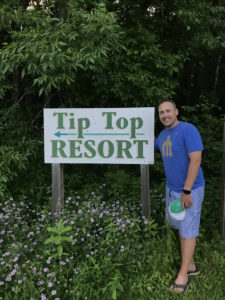 Every year we go to a Meyer family reunion at Tip Top Resort where family members come from all over the US to enjoy a relaxing week along the lakes of Minnesota. Birthdays and holidays are always celebrated with family. We would love to continue and share this tradition with our child. Raising our child in a loving home will be our number one priority. We want our child to feel loved and to realize the importance of family. Coming from diverse backgrounds, our child will be exposed to different cultures, which we believe enriches the overall life experience. We will expose our child to many different activities and will support them in whatever they wish to pursue and find passion in. We value education and will make it a priority. We don’t expect a child to follow exactly in our footsteps, but we will set aside funds for our child to get a college education, broaden their mind, become a good person and blaze their own trail – we will be there to support them every step of the way. After numerous fertility treatments, we are very excited about the opportunity to adopt a newborn to build our family. Our child will always know their roots and we will speak openly about and embrace their adoption story. Thank you so much for reading about us and getting to know a little bit about our family! Our hearts are open and ready to provide a loving home to a baby. We wish you the best in choosing the family that is right for your baby. If you would like to learn about us or to arrange an initial phone call, please call Cindy anytime at A Loving Alternative, 800-556-5635. Northern Minnesota, great catch Ani! Fresh coconut water, our favorite! Foot golf in Thailand - a first for us.